China's Military Latest Target In Anti-Corruption Drive : The Two-Way A former top general of the People's Liberation Army has been indicted for his allegedly lavish lifestyle and investigators say there's evidence of wrongdoing at key military units. 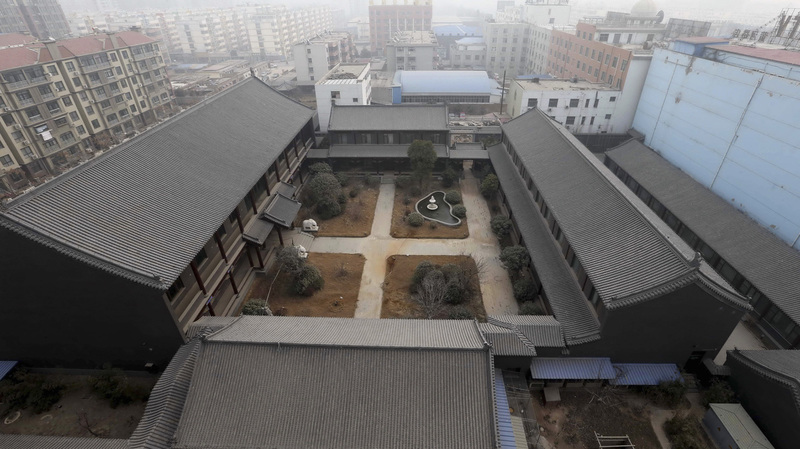 An unfinished residence which belongs to former PLA Gen. Gu Junshan is pictured in Puyang, Henan province, in January. China's anti-corruption campaign has expanded its reach to the country's military, with a former top general being charged and news that widespread wrongdoing had been uncovered at key units of the People's Liberation Army. Former Gen. Gu Junshan, who served as the PLA's deputy logistics chief, has been charged of "suspicion of corruption, bribery, embezzlement and abuse of power," state-run Xinhua news agency reported on Monday. Until now, it has been extremely rare for high-ranking military figures to be caught up in such probes. A guilty verdict is considered a near certainty. The BBC quotes Chinese investigative magazine Caixin, as reporting that Gu's apparently lavish lifestyle includes "several properties, including a home in Henan province modelled on China's former imperial palace, with several gold art pieces or statues." The ex-general's indictment was followed on Tuesday by a statement from China's Defense Ministry that inspectors, working on orders of China's President Xi Jinping, found evidence among Beijing-area units of problems with the handling of promotions, poor discipline of officers, illegal land transfers, and corruption in construction and military medical services. "The ministry said those cases would be further investigated and publicized 'for their deterrent effect,' raising the likelihood that offenders would be brought before military courts. "The PLA has long been dogged by a culture of bribery, corruption and power abuse. Promotions and plum assignments are sometimes secured by providing payments or favors to higher ranking officers and military assets, especially land, used for private economic benefit. "Officers enjoy official vehicles, housing and generous benefits in return for pledging their loyal to the ruling party, rather than to the Chinese state." China's anti-corruption drive has caught such high-profile individuals as regional communist party chief and former politburo member Bo Xilai, who was sentenced to life in prison after his conviction in September on charges of accepting bribes and abuse of power. In the same month, oil executive and politician Jiang Jiemin was abruptly removed from his senior government post on suspicion of corruption. As NPR's Frank Langfitt reported from Beijing last month, the secretive anti-corruption campaign has led to "abuse and torture of party officials."